For the 3rd ESA Sciology of Culture RN Mid-term Conference in Milan, Italy. Although urban communities in global cities appear quite different, particularly at first glance, spatial semiotic analysis reveals similarities in ‘glocalized’ spaces. People change the meaning of social spaces by changing the way these places look, through their activities and by their presence. Understanding how this meaning-making happens is critical to the study of urban places and cultures. Because of globalization, diverse people frequently live within the same political boundaries, but the real test of community takes place during the course of everyday life on the streets, in the shops, and in public spaces of neighborhoods. Class, racial, and ethnic hierarchies mark urban space with differential meanings. Though disadvantaged in conflicts with elites, ordinary urban dwellers express their agency in the ways they challenge and sometimes subvert the ‘official’ uses of social space. This entails, in part, remaking the space to look familiar in order to make the space their own place. Through their social interactions and their material traces, urban dwellers fill social space with expressive, conative and phatic signs of their collective identity. The spatial semiotic perspective, we argue, offers a way to transcend the usual global/local dichotomy of globalization research. Immigrant urban cultures produce spaces of mixture, where both similarity and difference co-exist. We present data from urban neighborhood communities in US and European cities. Our spatial semiotic analysis reveals how micro-segregation and group interactions produce urban culture, constrained by and challenging existing power arrangements, at the beginning of the twenty-first century. Timothy Shortell and Jerome Krase, Department of Sociology, Brooklyn College CUNY, USA. 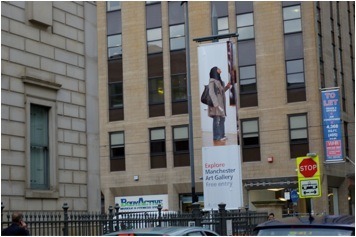 Photo: Banner for the Manchester Art Gallery, 2009. By Timothy Shortell.